It’s time again to revisit my periodic look at GIS StackExchange (GISSE) and what it may or may not tell us about the state of things geospatial. By now, the process is fairly routine. I have single Python script that gets tag data and parses it to CSV. I then hand-edit categories into the data for grouping purpose. While it’s perfectly valid to quibble with individual category assignments, I’m fairly consistent with it at this point, using previous data sets as a guide. Compared to last year, the all-time look hasn’t changed much. Open-source and “general topics” have switched places, but there were no great shifts that I could see. 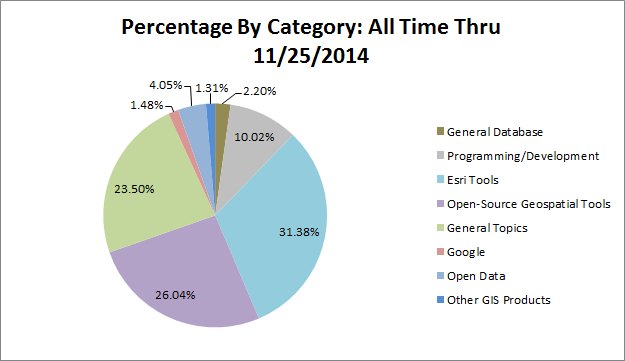 The roughly 4% increase in open-source topics could be a result of QGIS support moving to GISSE.